The Duchess of Cambridge has revealed that her husband Prince William initially struggled with his new role as a father, when his two children Prince George and Princess Charlotte were born. Catherine discussed the topic during a visit to the Hornsey Road Children’s Centre, where she mingled with fellow parents. Catherine’s visit to the centre was long over due, after she was forced to cancel her initial appearance there in September due to her severe morning sickness condition, Hyperemesis Gravidarum. 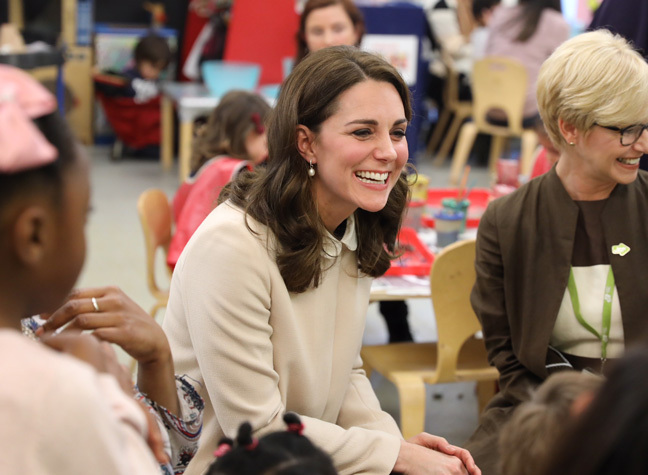 The royal spent the day at the centre, which provides childcare and family support to people who need it, to discuss maternal mental health, a cause close to her heart. Catherine, who is expecting baby number three, discussed her own children George and Charlotte with the parents, and revealed a few adorable details about the youngest royals. At one point in the day, the Duchess spoke to a mother-of-two, Michelle, about her son Jacob’s love of planes, and revealed that, just like his dad Williiam, George also has a keen interest in aircraft. 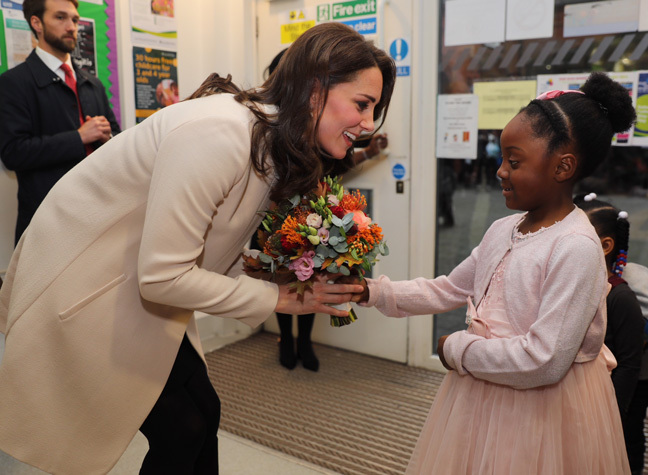 The Duchess of Cambridge also chatted with six-year-old Nevaeh, who presented the royal with a bunch of flowers. And it seems the young girl and Princess Charlotte have a little something in common. completing the look with a pair of black tights and black thigh-high, heeled boots from Russel & Bromley.